The committee expressed that the endurance of the “revolutionary Chavista and socialist” mantra. The Dominican Committee of Solidarity with the Bolivarian Revolution in Venezuela said Maduro’s win is a victory for Latin American and Caribbean peoples. May 21 (teleSUR) The Dominican Committee of Solidarity with the Bolivarian Revolution in Venezuela issued a statement to congratulate “Comrade Nicolas Maduro” on victory in the Venezuelan presidential elections. “The Dominican Republic celebrates the recent victory with all of Venezuela, all Venezuelans, and all Latin Americans despite imperialist threats and the isolated echoes of its deceptive allies,” the Committee of Solidarity expressed. 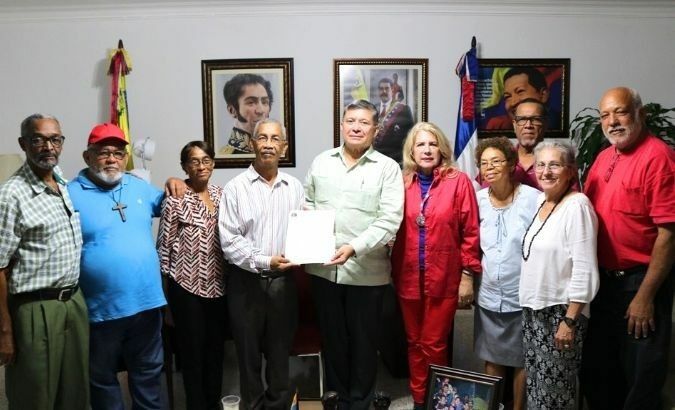 The organization reiterated solidarity with the people of the Bolivarian Republic, citing Maduro’s win as a victory in the continued fight of Latin America and the Latin American and Caribbean peoples. Members of the Dominican Committee of Solidarity with the Bolivarian Revolution. The statement added that President Maduro’s victory is demonstrative of the people of Venezuela’s commitment to commemorating the ideals of Commander Hugo Chavez – a future of peace, unity, and solidarity among Venezuelans, and by extension all Latin American and Caribbean peoples. Venezuela’s successful electoral process, the release says, incubates the strengthening of Interamerican institutions like Unasur, ALBA, and Celac by reinforcing the democracy between its national institutions. The Dominican Committee of Solidarity with the Bolivarian Revolution in Venezuela expresses solidarity with Venezuela amid @NicolasMaduro‘s victory in the presidential election. 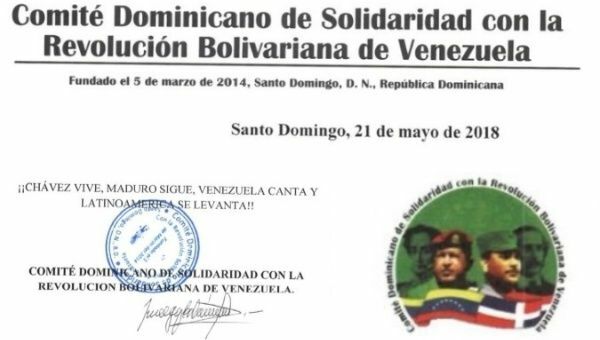 Dominican Committee of Solidarity with the Bolivarian Revolution in Venezuela said Maduro embarking on a new six-year term confirms the will of the Venezuelan people to be free, independent, sovereign and socialist. In conclusion, the organization highlighted a shared triumph with fearless people of Venezuela, Maduro, the United Socialist Party of Venezuela as well as Latin America and the wider Caribbean.